Michael Keaton and Danny DeVito compete to see who knows more about Dumbo director Tim Burton in a humorous new video. The live-action remake of the 1941 Disney animated classic hits theaters next week and the reunited actors are having a bit of fun promoting their upcoming project. 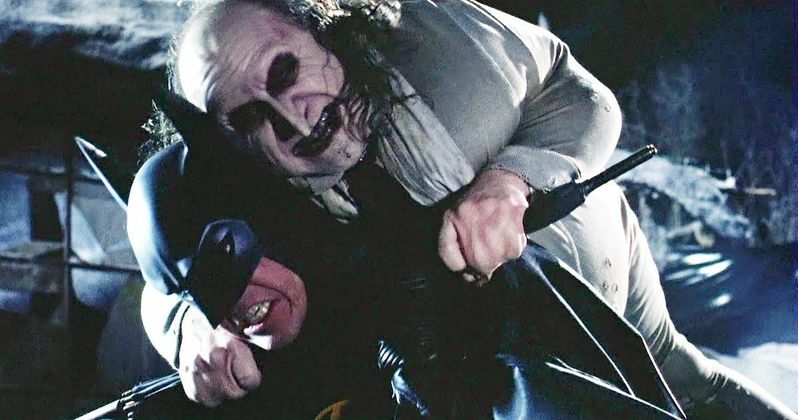 DeVito and Keaton famously starred in Tim Burton's Batman Returns in 1992 where the latter played the Dark Knight. DeVito played the villainous and over-the-top Penguin and now the tables have turned with Keaton playing the villain in Dumbo. When it comes to knowledge of Tim Burton, Michael Keaton might have the slight edge, having known the director longer. In the video, we learn that the enigmatic director likes to wear pinstripe socks for good luck during special occasions and that he's scared of chimpanzees. Burton played water polo in high school too, which seems a bit surprising. As for dressing in mostly black, the director does so because he doesn't want to have to think about matching colors and The Nightmare Before Christmas was based off of a poem that Burton wrote. The video of Michael Keaton and Danny DeVito is just to promote Dumbo, but it is obvious that the two actors enjoy each other's company. Tim Burton knows how to put together a perfect cast and it looks like he has done it again for Dumbo with the addition of Keaton and DeVito. The two first worked together in 1984's Johnny Dangerously. DeVito had this to say about working with Keaton again after all of these years. "The thing is: When you get a bonus like having Michael Keaton in it, it's like, 'Oh man, it's so good to be with your friends!' It's just cool to be on the set with them and have that experience. Michael and I worked on Johnny Dangerously years ago together, and we've been friends since then. He is one of the sweetest guys on the planet." As for working with Tim Burton again on Dumbo, Danny DeVito said that it was a "joyful thing," before noting that he knew that he was "going to be there." As far as playing a good guy this time while Michael Keaton takes on a villain role, DeVito states, "I needle him about it all the time." The actor also said that they he and Keaton had a blast when making Batman Returns with Tim Burton in 1992, calling it "operatic fun." Seeing Danny DeVito and Michael Keaton is one of the many selling points for Disney's upcoming live-action adaptation of Dumbo. The promotional material for the movie looks gorgeous and unlike anything that Tim Burton has pulled off before, which alone is enough to get fans into theaters. In the end, it's an outsider story and that is definitely something that Burton is comfortable with and excels at. You can head over to Entertainment Weekly to watch Danny DeVito and Michael Keaton quiz each other on Tim Burton trivia.